We call on the College to institute a section of first-year orientation that deals explicitly with race. Leana Amaez, Benjamin Harris, Janet Lohmann, Koa Khoung and a group of students are working to develop a new program for first-year orientation for the class of 2020 that will address issues of race and bias. We call on the College to institutionalize a race discussion for incoming international students. International students will be a part of the same orientation as first-year students. Dean Amaez does not agree with the view that international students require additional training to that offered to all incoming first-years. We call on the College and the Residential Life department to further train its staff members on race and how to facilitate race discussions. ResLife staff, Peer Health, College House officers and IHC officers received increased training on race, gender and sexuality. Several student affairs staff are now trained to facilitate intergroup dialogue. More sessions are planned. We call on the College and Residential Life staff to provide its College House members with race training in addition to working to create a more inclusive space within the College House System for all students. ResLife added a question to the College House application that specifi- cally address diversity, and officers had additional training on facilitating inclusivity in houses. We call on the College and the Bowdoin Outing Club to work with students to make the BOC a more inclusive space and to modify the OZ program so it is more satisfactory to students of color. According to Outing Club Director Mike Woodruff, OZ training continues to grow and adapt in response to student feedback with the goal of making the BOC a place that all students feel they can take advantage of. The BOC has also implemented intergroup dialogue into some of its programs. We call on the College to support the Women's Resource Center in designing new programs and support systems for women of color at Bowdoin. The Women's Resource Center holds an annual retreat for women of color and will continue this program into the future along with other programs and trips geared towards building community amongst women of color at Bowdoin. We call on the College to consider a student's racial and socioeconomic background when making decisions about disciplinary action. We further ask that the College uphold consistent disciplinary policy for all students, regardless of parental interaction with the institution. According to Dean of Student Affairs Tim Foster, the College tries to consistently and thoughtfully uphold community standards in all cases. Foster says he stands behind the good work of the Judicial Board. We call on the College to more actively recruit student athletes and coaches of color, and ensure that they are well supported once they are part of the Bowdoin athletic community. According to Ashmead White Director of Athletics Tim Ryan, the college is adopting hiring practices to diversify their coaching staff. The Athletics Department has been working with admissions and coaches to place emphasis on diversity when recruiting. Athletics will begin incorporating intergroup dialogue into their programs. We call on the College to set a precedent of actively addressing and adequately reprimanding students and teams involved in these offensive acts. Athletes should not be above or exempt from standard college social policy. According to Ryan, the College looks at each situation individually and in context, and tries to impose consequences that will serve as learning experiences and positively impact the community. We call on the College to further its recruitment of faculty of color, particularly in tenure-track positions, and increase the diversity of faculty in a way that addresses the diversity in race, ethnicity and class backgrounds that are represented by the student body. The College has brought in Romney Associates, a consulting group that specializes in hiring and retaining a diverse staff, to conduct workshops with faculty undergoing searches in their departments. The newest group of tenure track faculty (Margaret Boyle, Judith Casselberry, David Hecht, Abigail Kaline, Jeffrey Selinger and Yao Tang) includes several faculty of color. We call on the College to work with current faculty of color to establish or strengthen a support system that would aid in the retention of faculty of color. According to Professor Brian Purnell, the College has the obligation to create a healthy and respectful work environment, but this is something the community must help them figure out. Romney Associates also works with retention and support of a diverse staff. We call on the College to establish and require a training for all faculty on race, and how it relates to Bowdoin students, particularly students of color. Training must include all new, tenured and visiting faculty. There is no mandatory yearly training for all faculty on discussing with issues of race with students. Some students have stated that they do not feel there is adequate discussion of race issues in their classes. We call on the College to encourage a more integrated curriculum where topics of race are woven in outside of departments like Sociology, Anthropology and Africana Studies, where discussing race is unavoidable. Furthermore, professors should be encouraged to discuss racial events that affect our national climate (for example: a Chemistry professor ought to have been able and willing to set aside ten min- utes of class to acknowledge the significance of the non-indictment of Darren Wilson, or at the least echo empathy for affected members of the class). Professors will succeed in communicating the value of supplementing intellect with compassion when empathizing with the felt struggles of living in a world in flux. Although multiple administrators and staff think that there has been more conversation about racial issues this year, the College has not dramatically changed its curriculum, and some students still wish that these issues were given more airtime. We call on the College to release a public statement addressing this support. President Rose acknowledged issues of race on campus and outlined the steps that the College plans to take in a December 3, 2015 email to campus. We call on the College and the Bowdoin Outing Club to work with students to make the BOC a more inclusive space and to modify the OZ program so it is more satisfactory to students of color. Student Affairs has outlined several programs to educate students on race and create inclusive spaces. Many departments have worked with dialogue facilitators and Sarah Washington '17 has been elected to the newly created position of BSG Multicultural Representative. We call on the College to expand the staff and programming available to aid students of color who are adjusting both academically and socially to Bowdoin. This task could potentially be the responsibility of the Director of the new Student Center for Multicultural Life. We further call on the College to be more explicit in the mission of programs such as Bowdoin Explore and Bowdoin Experience so that prospective students have more realistic expectations for the program and for Bowdoin as a whole. Director Benjamin Harris continues to work to develop the Student Center for Multicultural Life through increased programming and funding as well as publishing a newsletter to update the campus community. We call on the College to declare Martin Luther King, Jr. Day an official College holiday, to explicitly state the closure of all offices and classes on this day, and to provide a comprehensive schedule of events honoring civil rights and African American history on this day. MLK Day will fall during winter break until 2020, after which Bowdoin will adjust its calendar to close the College on that day. 1. We call on the College to provide an option for anonymity when reporting the occurrence of a bias incident in order to encourage those students who might want to report a bias incident but who do not feel safe in doing so. 2. We call on the College to promote the option of reporting a bias incident by educating the student body about the process at the beginning of each academic year. The College is working to create a system for anonymous reporting of bias incidents to be implemented within the semester, as well as a new landing page for diversity and inclusion resources on the Bowdoin website. 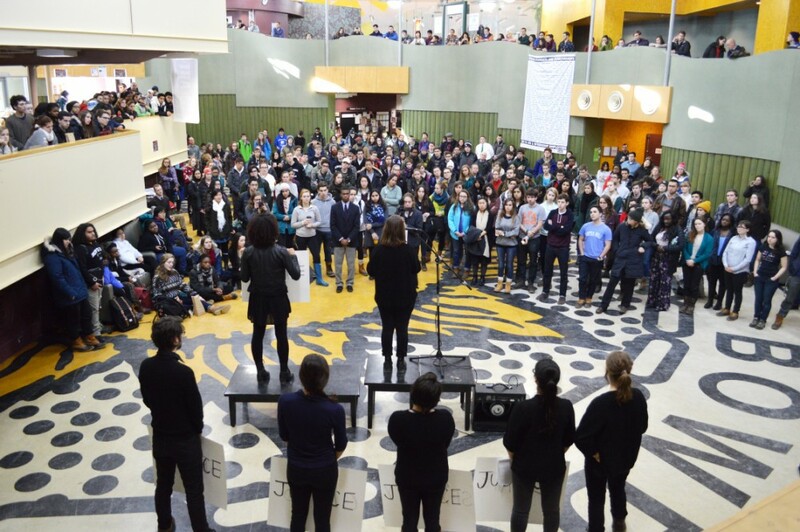 Race and diversity issues continue to permeate the lives of Bowdoin community members. “Race is a dividing line in our society, on campuses across our country, and at Bowdoin. Those of color in our community experience Bowdoin differently than those who are white; the difference can be profound and occurs in every aspect of our lives here,” wrote President Clayton Rose in a December 3, 2015 campus-wide email. The work of campus activists has not gone unnoticed by the administration, and the calls to action presented in the open letter have led to a real effort to shape the College into a place that is both diverse and inclusive. A year after the meeting, its message has not been forgotten.